The city of Varanasi lies on the northern bank of the Ganges. Throngs of pilgrims descend to bathe in this sacred water or climb to explore the city’s more than 1,500 temples. While there are historical records of pilgrimages to Varanasi dating back to the seventh century, to the faithful this sacred destination has existed as a bustling holy city for much longer. Many of Varanasi's temples were destroyed in the seventeenth century during the reign of Aurangzeb, yet today the view from across the Ganges suggests timeless splendor. Lord Buddha had given His first sermon only six miles away at Saranatha, where there are still many Buddhist stupas and where many followers of the Buddhist philosophy live. Sripada Sankaracarya, the incarnation of Lord Siva who toppled Buddhism from its dominant position, had come to Varanasi in A.D. 695, shortly after taking sannyasa at the age of eight. 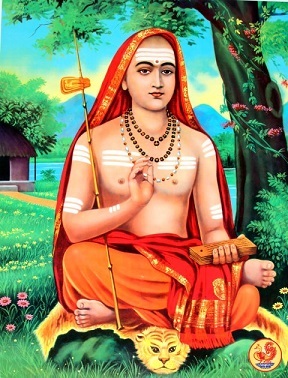 After four years at BadarikaSrama in the Himalayas, where he wrote his famous commentary on the Vedanta-sutra, Sankaracarya returned to Varanasi , which remains a stronghold for his followers and for the worship of Lord Siva. As the city of Varanasi takes centerstage in the prevailing political scenario of india, those interested in spirituality ought to know the position of Lord Siva. Lord Siva is very difficult to understand, in some ways even more than Lord Krishna . Lord Krishna is the Supreme personality of Godhead, and the individual spirit souls are all subordinate to Him. Lord Siva is also subordinate to Lord Krishna . Lord Siva’s position is always transcendental although sometimes it may not seem to be so; he seems to be affected by material nature. He wanders in the crematorium with snakes on his body. He gets very angry, so angry that his anger cannot be compared to anyone else’ in this material world. I t can destroy the whole universe. The impact of floods or terrorist activities is nothing when compared to the devastation that occurs when Lord Siva gets angry. These floods and terrorist activities are all representative of a fraction of Lord Siva’s anger. He appears to be the Supreme Lord from one perspective. He is also known as Paramesvara. How can that be? isvara parama Krishna : “Krishna is the Supreme Personality of Godhead.” But within the material world he is the Supreme Controller because Krishna does not directly involve in these activities. But Lord Siva gets involved, very much involved. He is the form that the Supreme Lord takes to interface with the material energy and he appears to be himself materialistic, although he is not. He apparently has two faces – that of a great devotee, always meditating, and the other face is of one worshipped by ghostly persons, impersonalists and evil spirits. However, Lord Siva can involve himself in this material world, but at the same time be completely aloof. He can drink the ocean of poison but not be affected. He can move with ghosts, engage in procreation, and be with the impersonalists; but he does so superficially. He is completely transcendental. The ashes on Lord Siva’s body are from the wood mixed up with the ashes of the burnt dead body in the cremation pyre. Even if one goes to the cremation ground, one becomes impure and cannot perform any ritualistic activity, cannot enter a house or a temple and has to take a bath, go through purificatory process. But when Lord Siva does so, it is auspicious. His very name invokes auspiciousness. Saintly persons remember him. Nonsaintly persons remember him also and thus get a chance to be purified. He is a devotee in disguise. He apparently comes down to the level of the ignorant, so that they can begin to be regulated, come to the Vedic path, by his mercy. in Siva Purana, Lord Siva says to Parvati that in Kali-yuga, in a brahmana’s body (refers to Sankaracarya) he would preach the Mayavada philosophy. Generally the worshipers of Lord Siva are Mayavadis. Lord Siva himself says mayavadam asac-chastram. AsatSastra refers to the doctrine of impersonalism, or becoming one with the Supreme. Bhrgu Muni cursed that persons who worshiped Lord Siva would become followers of this asatsastra. Lord Siva’s preaching as Sankaracarya, from the standpoint of Krishna consciousness, is to be rejected. But he had a purpose in that also: to bring people to the Vedic path, at least to the formalities of the Vedic path. So he preached the same Buddhism in the name of the Vedas. As stated in Caitanya-Caritamrita (Madhya 6.148), veda na maniya bauddha haya ta’ nastika vedaSraya nastikyavada bauddhake adhika: “The Buddhists do not recognize the Vedas. However, those who take shelter of the Vedic scriptures yet preach agnosticism in accordance with the Mayavada philosophy are certainly cheating and are more dangerous than the Buddhists. Why is it so? Sripada Madhvacarya answers: vede ramayane caiva purane bharate tatha adav ante ca madhye ca hariu sarvatra giyate – in the Vedic literature, including the Ramayana, Puranas, and Mahabharata, from the beginning to the end, and in the middle, only Hari, the Supreme Personality of Godhead, is explained. The philosophy expounded by Sankaracarya takes the Vedic version and concludes that we are all Hari. The impersonalists may say “He is supreme” but then add “we are also supreme” which negates the Supremacy of the Supreme Lord – a very dangerous philosophy. But it had its purpose also. And who but Lord Siva could have preached that which is highly inauspicious yet from another standpoint somewhat auspicious. Buddhist philosophy completely destroys any semblance of spiritual life, but it appears to be good; right action, right speech, very moral and emphasizes: ahimsa parama-dharma – the highest religion is non-violence. But it is topmost violence since it “kills” the soul; the very existence. Lord Siva comes on the order of Lord Narayana to make a bridge for those who are sinful and attracted to such philosophy. He vigorously defeated Buddhist philosophy while preaching more or less the same thing. “Everything is nothing”, say the Buddhists. They have a philosophy to justify nothing and different sects based on the type of Nothingness. Lord Siva as Sankaracarya preached, sarvam khalv idam brahma: “Everything is Brahman.” No form, no activities, no thoughts – just it is. I t was extremely inauspicious but was needed for any subsequent scope for auspiciousness. I t is a misrepresentation of the Vedic path but at least it had the strapping of the Vedic path and there was at least a verbal acceptance about the Vedic path. Even today the Mayavadis and Vaishnavas have more or less the same culture: both accept Sastra, the sanctity of Ganga, the supremacy of Lord Govinda and varnaSrama institution. There are many things that the impersonalists and devotees have in common up to the point of liberation – that we are not this body but spirit soul, this material world is miserable and temporary and we are meant for spiritual existence. But when it comes to the nature of liberation – at that point the divergence is so great that they are philosophical enemies. Who could reintroduce Vedic culture in the only way possible at that time and himself be not affected? Only Lord Siva! So it is very difficult to understand him. He appears to be engaged in inauspicious activities, he is surrounded by inauspicious people, but he is most auspicious. He is worshipable by Vaishnavas since he perpetually meditates on Lord Rama. “Exalted, selfsatisfied persons preaching to the entire world think of your lotus feet constantly within their hearts.” We ought to remember Krishna at all times, but here it says that these great personalities remember Lord Siva at all times. That’s because to think of Lord Krishna means to know Him as a person, His names, forms, qualities, activities and associates. Lord Siva is remembered as an associate of the Lord. Wherever there is destruction, unnecessary anger, devotees see the rudra principle manifested. 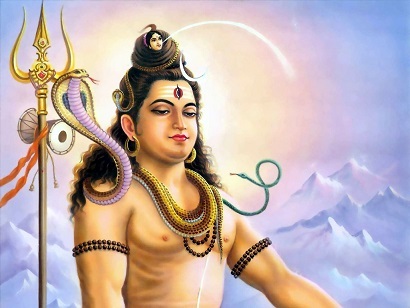 Lord Siva is not in tama-guna but facilitates those attributes in earthquakes, hurricanes, floods, abominable activities, and meaningless violence through those inclined to tamaguna. Why does he do this? Just to facilitate the sinful desires of living entities – that is Lord Siva’s thankless task. “Wherever there are Yogesvara, Krishna and Arjuna, the greatest fighter, there will undoubtedly be victory.” Everything is auspicious in the activities of Arjuna as a pure devotee. But in the fighting of the grossly sinful people, there is no victory and no one wins. Even though Lord Siva facilitates inauspicious behavior, he is fully auspicious. Worship of Lord Siva – What is the Right Mood? Devotees do not worship Lord Siva; their worship is for Lord Krishna but they recognize Siva’s greatness. 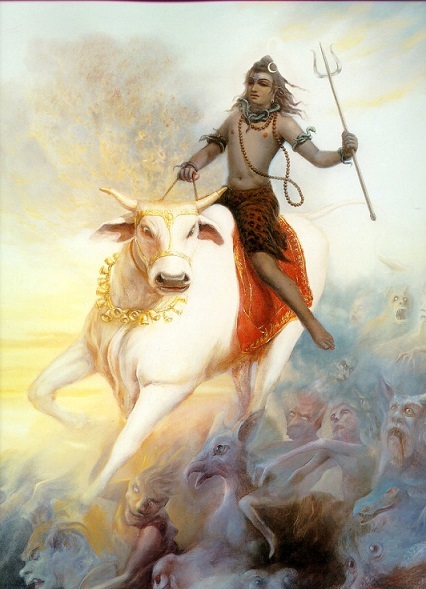 The worship of Lord Siva considering him to be independent or thinking that Vishnu is one manifestation, Siva is another, Brahma is yet another manifestation, and that there are many manifestations, is a misunderstanding. Lord Siva is extremely powerful, no doubt, but he considers himself as servant of Lord Vishnu . So to worship anyone – Siva, Brahma, Vayu, etc, what to speak of the modern imagined avatars – as God, is an offence. We are eternally Krishna's servants. By understanding Lord Siva to be His great devotee, we appreciate him. I t is said, ekale isvara Krishna , ara saba bhåtya: only the Supreme Personality of Godhead, Krishna , is master, and rest are servants (Cc. adi 5.142). Siva-tattva is difficult to understand. He is an eternal servant of Lord Krishna . I n this material world, he performs many functions of the Supreme Lord and appears as Supreme Lord to those bereft of proper knowledge. The Vaishnavas worship Lord Siva, all the time, by worshipping Lord Krishna . But it’s not the same as saying; “i worship Lord Siva and thus worship Lord Krishna .” it doesn’t work that way. Because Krishna includes everything and Lord Siva includes everything in this material world only. He is also part and parcel of Krishna , the Supreme personality of Godhead. Lord Siva is to be respected as the topmost Vaisnava. Milk changes into yogurt when mixed with a yogurt culture, but actually it is constitutionally nothing but milk. Similarly, Govinda, the Supreme Personality of Godhead, assumes the form of Lord Siva for the purpose of material transactions. I offer my obeisances at His lotus feet. 1. Because Rama is said to have worshiped Lord Siva (although not mentioned in Valmiki Ramayana), it does not mean He is not the Supreme Lord and Lord Siva is. Lord Rama did so in his nara-lila, in his role as an ideal human being. 2. While the Milk Ocean was churned, it produced a dangerous poison named halahala and it forcefully spread in all directions. All the demigods, along with the Lord Himself, approached Lord SadaSiva and sought his shelter. Since the Supreme Personality of Godhead was personally present, why did He accompany the demigods to take shelter of Lord SadaSiva? In this connection Srila Madhvacarya answers that Lord Vishnu was fully competent but in order to give credit to Lord Siva, who later drank all the poison and kept it in his neck, He did not personally take action. Lord Siva associates with ghosts, the people who are addicted to the most abominable activities. Many great souls have criticized and condemned him and each of them had to pay the consequences. He is the up-lifter of the most fallen. He is going down to the places of those who are in the mode of ignorance and is behaving like them just to gain their faith. I t is not that he is attached to the ashes of dead bodies. But to show compassion to this class of man, he is willing to even to go to that extent. So his apparent deviations from the traditional ways of Vaishnavas are simply out of compassion to get these people become attached to him and gradually they would become purified by following what his instructions. It is simply not possible to understand his activities completely and therefore it is said, “Do not try to imitate to great souls but just try to follow in their footsteps.” One can truly appreciate Lord Siva by taking up Krishna consciousness in all seriousness. Whether Varanasi has the ability to uplift the political situation of india we do not know, but as the abode of Lord Siva it certainly has the ability to uplift india spiritually. Damodara Nityananda Dasa (Dr. Dipankar Deb) is a disciple of Srila Bhakti VikaSa Swami. He holds a Ph.D. degree in electrical engineering from the University of Virginia. He is the author of an upcoming book, Science, Nescience and Perfect Design.